GR ratings comprise the unique approach of the Great Racehorses team to rating the leading horses since 1965. GR Ratings also enable comparison between horses in different countries, although they may never have raced against each other, and between horses who raced in different decades. GR Ratings take into account the number and Group status of races won, the time and the manner and style of the win, including the winning distance. Not all horses in the site are given a GR Rating - only the top horses in each year are given a GR Rating. 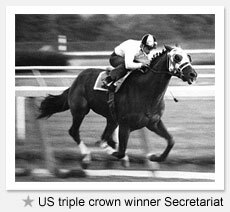 The top GR Rating so far is the GR 145 awarded to 1973 US Triple Crown winner Secretariat, followed by 144 awarded to the top European duo of Mill Reef and Sea Bird II. Other European horses to have received GR Ratings of 140 or more include Nijinsky, Brigadier Gerard, Shergar, Dancing Brave, Dubai Millennium and Sea the Stars. US horses at or above the 140 level include Affirmed, Seattle Slew and American Pharoah. As the GR Ratings cover horses since 1965, some famous Great Racehorses before that year have not been given a GR Rating, although they are particularly highly regarded as great champions. These include Ribot from Italy, Hyperion, Bahram, and Tudor Minstrel from England, Citation and Man O'War from the USA and Phar Lap and Tulloch from Australia. Copyright in all GR Ratings and biographies are owned by Great Racehorses of the World.